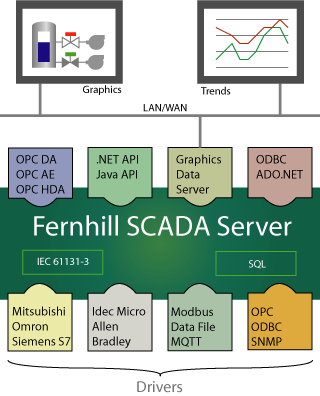 Fernhill SCADA is free runtime SCADA/HMI software. Deploy any number of SCADA sytems with a single low cost developer license. Fernhill SCADA is used in a range of industries from wind farms to wine production. Fast vector graphics (25 frames per second). Operator interface for Windows, Linux and Android. PLC Drivers for Allen Bradley, Mitsubishi Melsec, Modbus, Omron, Siemens S7 and more. IT Drivers for MQTT (Iot), ODBC, OPC and SNMP. Autodetect Wizards to search for and automatically configure tags for PLC devices. Online, or offline, configuration using the Configuration Tool. Graphic import tools supporting most bitmap formats and DXF (vector graphics format). A client-server architecture supporting multiple Operator Interfaces and Configuration Tools. A built in text report generator with export to email or MQTT topics. An alarm list for abnormal conditions. An alarm router to forward alarms to email recipients. A historian to log tag values for later analysis. An event log to audit user actions. ODBC and OPC data access interfaces for external report tools and data export. Java and .NET APIs for external software applications. Free runtime, which includes all drivers.